The largest single video screen in the world is getting a next-generation reboot, and Watchfire Signs of Danville, Ill. has been selected to imagine and manufacture it. Watchfire was selected from among 15 digital screen manufacturers from around the world to completely rebuild the canopy that is part of Fremont Street Experience in Las Vegas. The $30 million project will be completed in 2019. The upgraded canopy—the first update in 14 years—will deliver a screen that is up to seven times brighter than the original and four times sharper, making it vivid even during daylight hours. The spectacular-sized screen will include innovative technology custom-designed for the project. 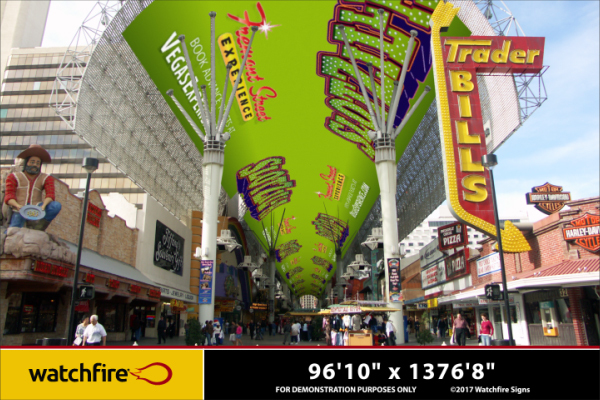 Core to Watchfire’s plans is a new product developed specifically for Fremont Street Experience. Watchfire’s cutting edge design includes a fabric-like module that can be trimmed and resized into thousands of shape configurations without impacting the information displayed. The design allows airflow through the modules, critical for installations in high heat and in situations with restricted airflows. For Fremont Street, the innovative design allows light to reach the street level and for the canopy to shed rain. This new canopy will increase contrast by four times compared to the existing screen, allowing content to be displayed on the canopy during daylight hours for the first time. Fremont Street Experience attracts more than 20 million visitors annually and is adjacent to 10 casinos and more than 60 restaurants. The Las Vegas Convention and Visitors Authority board supported the expenditure after noting that an estimated 53 percent of Southern Nevada’s 43 million visitors went to downtown Las Vegas on their trips to the city and 59 percent specifically went to see the giant LED canopy. The spectacular digital canopy and entertainment destination is 1,500 feet long and is suspended 90 feet above a pedestrian mall. A light and audio show by Viva Vision plays every hour in the evening and SlotZilla operates zip lines the length of the canopy. Watchfire’s plan minimizes the impact on adjacent businesses that will remain open during the upgrade, as well as to pedestrians. The canopy will be upgraded in eight sequenced phases, during which 1/8th of the canopy length will be replaced at a time. During the upgrade, content on the canopy will run seamlessly between the old and new sections. The enhanced brightness of the new canopy will be demonstrated at the end of the installation when the full capability of the board is activated. Installation will begin in early 2019 and is expected to be complete by the end of the year. Let us help you find an experienced sign company. Our network of qualified sign partners are standing by to help you choose the right sign for your location and budget.